Defense Grid 2 (Win - Mac - Linux) - Buy and download the game here! 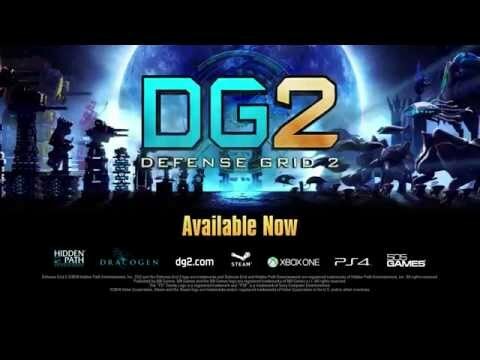 Defense Grid 2 (DG2), the sequel to the critically acclaimed Defense Grid: The Awakening, is the next evolution in tower defense, bringing PC and console fans new strategies within dynamic and evolving battlescapes that can be played in single-player or co-op and competitive MP. Dynamic, constantly evolving battlescapes ups the challenge, offering DG2 players endless ways to tap into resources and build towers in order to defend against waves of incoming enemies. The controls are intuitive while the gameplay is deep. In DG2, players must protect human colonies by taking their prowess and skills to other planets where they soon come upon alien invaders on an asteroid outpost. The Asteroid Surface level gives players an opportunity to guard their cores on a pre-set path map, offering a few alien redirection options along with new game lighting, visual effects and a new level of detail that will immerse players in the experience. After successfully protecting the cores found on the Asteroids, players journey to several planets. Upon arrival on Garesh, the population needs help to keep their cores and society intact. The Derrick facility rises out of the ocean amongst an atoll of islands, giving players an opportunity to significantly redirect the aliens from platform to platform so their arsenal of short and long range towers can repeatedly prevent invaders from reaching the cores. The Derrick facility also demonstrates how levels change dynamically, adding new places to build and new ways for players to adapt their strategy. Individualize The Experience – Upgrades and power ups allow gamers to enhance and customize their strategy as they play in order to react quickly to new challenges. All-New Features – The game features a new engine, maps, campaign, characters, enemies, towers and more. Multiplayer – All-new to the Defense Grid universe, DG2 features two-player co-op and competitive MP modes. Players can work with or against other players to evolve strategies. Co-op mode allows players to work with a friend to build towers and defend power cores. Competitive mode allows players to compete and modify each other’s gameplay experience while interacting. User Created Content – PC players will be able to design and share their own battlescapes online. Additional Notes: DG2 requires a multi-core processor and at least 3 GB of RAM on your computer to run. DG2 relies on a DirectX 10.0 or later graphics engine which means it runs on Windows Vista, Win7, Win8, and Win8.1. DG2 will not run on Windows XP. DG2 requires a video graphics card or chipset that supports DirectX10, video cards made with current technology after November 2006 (up to 7 years old). Compatible graphics cards include any AMD Radeon graphics card with the "HD" or "RX" designation (HD2000-HD8000, RX200-RX300+), any NVIDIA card after and including the 8000 series (8000, 9000, 100, 200, 300, 400, 500, 600, and 700+ series), and any Intel graphics chipsets released on the GMA X3100 (2007) architecture and later (GL960, GM965, B43, Q43+, G41, G43, G45, GL40, GS40, GM43, GS45, Core i3 integrated graphics or later, Intel "HD Graphics" or later). DG2 requires Steam to run. © 2008-2014 Hidden Path Entertainment Inc. Defense Grid and Hidden Path Entertainment are registered trademarks of Hidden Path Entertainment, Inc. All rights reserved.